Meskel [mäsqäl], meaning Cross, is one of the major national and religious holidays in Ethiopia. Christians throughout the country celebrate Meskel to commemorate the unearthing of the True Cross used in the crucifixion of Jesus. 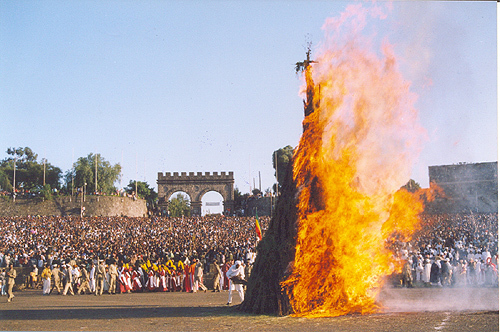 This popular Feast of the Cross takes place on Meskerem 17 of the Ethiopian calendar, corresponding to September 27 in the Julian calendar. In rural communities, the preparation of the Feast starts several weeks in advance. On the Eve of Meskel, “Demera”, Bonfire in Amharic, takes place in the nation’s capital where people from diverse communities attend a colorful vibrant event of religious chanting at Meskel Square. It is widely believed that the True Cross was discovered by Saint Helena, the mother of the Roman Emperor Constantine, during a pilgrimage she made to Jerusalem in 326. A fragment of the Cross is said to be kept at an Orthodox church in Wolo region of northern Ethiopia. Besides its religious aspect, Meskel is a special time of the year when families get together and urban dwellers visit their rural relatives. The immense participation of families, especially among the southern communities, adds to its significance and beauty. Others use the occasion to promote peaceful coexistence, resolve personal conflicts, and enhance spiritual life. In other Christian countries, there are various Feasts of the Cross [Exaltatio Sanctae Crucis], all celebrating the Cross as an instrument of salvation according to their particular customs. Image and details on Meskel provided by Country Director in Ethiopia, Desta.